One of the very first things we worked on when moving in was getting all the toys into toy bins. As a lot of you are, we are big IKEA lovers. We’ve had two of these staircase-looking TROFAST organizers for a while, but somehow with two active boys they weren’t enough for all of their toys! Rather than get rid of toys we got another organizer. However now that this wall is full to the brim, we really can’t get any more bins. You want to know how to ensure that your children are aware of all the toys they can play with? You label them! And not just with word labels. With pictures too, especially if you have young children who don’t know how to read. Since putting labels on the bins, the kids have interacted with almost every toy bin. Yes, we still have messes, but I love knowing that we aren’t just holding onto toys for no reason at all – the toys are all actually played with! Having your toy bins labeled also helps encourage your little ones to organize. They can actually see where everything needs to go instead of throwing toys into random buckets when they are done playing with them. This was one of my biggest pet peeves before, but now if they want to find a certain toy, they know exactly where it is. One thing I love about the TROFAST organization system are the different sizes of boxes available. You can get them in small, medium, and large. We just had everything in the medium sized bins initially, but after having it that way for a while we discovered that some bins could be split into smaller ones, and others (like the puzzles) really needed to be in bigger bins. I like everything neutral and all the same, so we got all white boxes. But they do have many different colors available if you are wanting something more colorful. You can find the vinyl toy labels both as is and customized to your needs in my Etsy shop. The map of the United States in the image below is something that was around my house growing up. My mom offered it to me when I was looking for ways to spruce up the basement. I’m not one to turn down free things, so of course I took it! Our children have been to quite a few states already and Mr. R is always asking how far away things are, so hopefully having this there will give them a little idea of how big our country is. The next step is to put up markers of all the places we’ve been. I’d love our children to be able to visit every state, and this is a great way to keep track of that. To go along with the traveling theme, I had to put a fun related quote on the wall. I love, love love love the Oh, the Places You’ll Go book by Dr. Seuss, so naturally this quote had to get put somewhere! 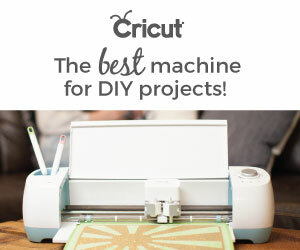 My Cricut Explore 2 gets so much use making things like this and the toy labels. You can cut them out by hand for sure, but using this machine makes the process so much quicker! I put the quote in my resource library in case you’d like to cut it out for yourself. Or if you’d rather have one pre-made for you, the vinyl quote is also up in my Etsy shop. Finally, as part decor and part organization, I put plastic hooks on the wall to showcase the capes I’ve made my boys. Since making the original super hero ones, they’ve requested Captain Underpants capes, so there they are as well! The capes still end up on the floor by the end of the day since they are played with so much, but hey, when the room does get cleaned, at least there’s a place for them! So there you have it, our play room reveal! It’s such a delight to see everything nicely organized. What organization tactics have worked for you? Do you have your own labels for your kids toys? How did you make them? Share in the comments! Like this post? Mind sharing the following image via Pinterest? Thank you! I love the labels on the containers! I have those same ones for my sons. It’s great to have a specific place for each toy, it helps prevent them from being all over the house! Great job! I’m always looking for new ways to keep our kids toys organized! Toy organization is what I like to call a work in progress in our house! ha! I love your labels with pictures! It’s a nice touch and I bet it helps kids when it’s time to help with clean up! Great tips that I will keep in mind as I get our own toy organization under control! Good luck! It’s been a work in process since my six year old was born. I think we finally have it under control! I love the tips. I especially love the large labels with pictures. We have specific bins for different toys as well, and I find they are more likely to put them away if there is a designated spot for them. Not that it always happens but at least it is a step in the right direction. Great job, organizing that play room! I love the labels on the bins!! We are currently transforming our playroom into a bedroom for my daughter, but I will be using these tips to create a play space in our sons’ shared room! Good luck Jenny! I’m glad this post was useful to you! I’m loving this play room! I’m all about organization and I especially love the quote on the wall, great job designing this room! I looove those labels! So much better than masking tape and a sharpie! How cute! I love the labels since I never remember which container I put things in. Same here! I need to label everything in my house. I think it’s stay organized much longer that way!